The Horror Digest: Poltergeist: No One Cares About Robbie. I absolutely love this blog! I'm a big horror movie fan and you've reviewed some gems here. I've seen Waxwork and it's not half bad. 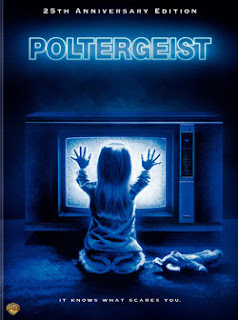 And Poltergeist, well, that may be one of the greatest of all time. Nice job! Just found your website last week as I was surfing the web and learning about soon-to-be updates to The Stand and The Shining (JOY-GASM!) Love your blog, keep up the great work! Poltergeist kept me in nightmare mode for MONTHS. The clown doll scene and the hallway scene were my two favorite scares, but by FAR the best scene in this movie is at the end, when the family checks in to a hotel and ditches the TV! One of my favorite movies. And its true. All the scary stup happens to the boy. The kitchen scene with the meat and sink are great as well. Every time I'm in a hotel with a large hallway, I can't help but think of the movie. Also, There are alot of funny lines, even in really tense moments.